Recently, three Santana veterans, Armando Peraza, Raul Rekow, and Karl Perazzo, conducted the first of three scheduled LP sponsored clinics at O. DiBella Music in Bergenfield, NJ. Beforehand, they were welcomed into the LP studio for a photo and recording session. This was octogenarian, Armando Peraza’s, first visit to LP in fifteen years. The youthfulness and enthusiasm with which he performed were an inspiration to everyone in attendance. I have known all three gentlemen for many years, and I am proud, as is everyone at LP, of our association with such fine musicians. Through them and their affiliation with Santana, our instruments have reached a wide and varied audience. years with Santana, as well as his groundbreaking work with Charlie "Bird"
namesake of a top-of-the-line series of congas and bongos. 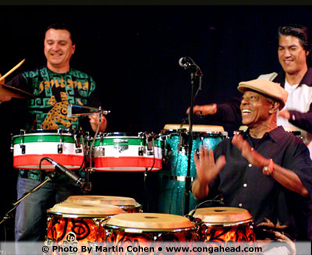 Karl and Raul teamed up with LP to create a reasonably priced, quality line of congas, bongos, and timbales called "The Karl Perazzo & Raul Rekow Matador Line". The Raul Rekow congas are cloaked in Raul's signature green glitter and have the quality features that percussionists have come to expect from LP's Matador Series.